Providing fun, food, and fellowship for more than 25 years! 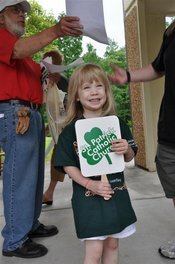 Springfest represents many things to the community of St. Patrick Catholic Church in Adamsville. It is not just a fundraiser, but a fun raiser. It's a time when the members of the church join together to put on a wonderful festival with games, food, a silent and live auction, and fun. Through Springfest, parishioners come together for the common good of the church and the community. Many people in the Birmingham area look forward to the opportunity to join us for good food and family fun. Springfest 2018 will be held on Sunday, March 17, 2019. This is our 35th year to hold this fundraiser and it promises to be a great day of fun for the entire family.